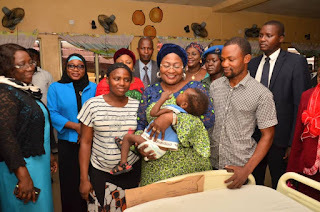 Indigent patients at Obafemi Awolowo University Teaching Hospital, Ile-Ife could not control their emotions after the Governor of Osun state, Mrs. Kafayat Oyetola settled their medical bills. This gesture was in line with the IleriOluwa Development Initiative's corporate social responsibility which seeks to lend a helping hand to the less privileged in the society. Part of those that benefited from IDI, an NGO under the leadership of Mrs Oyetola, the President of the organisation, was a young patient who is suffering from hole in the heart disease. The patient's mother, Mrs Mary Abioye could not hide her joy when it was announced to her that the medical bills of her son had been paid. 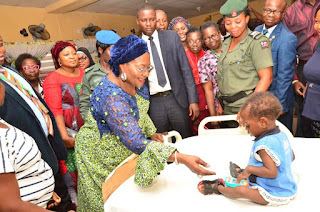 Mrs Oyetola who visited the hospital also presented gift items to other patients in the hospital. She said caring for the less privileged and support to the needy and vulnerable in the society are the callings of the NGO. She however called on all privileged Nigerians to put more efforts in assisting the less privilege in the society most especially on health care delivery, education of children empowerment as the multiplier effect to the nation is enormous. The wife of the Governor reiterated that, the present administration in the state of Osun has put all machinery in place to rehabilitate all the health centres in Osun so that citizen of Osun particularly pregnant women and nursing mothers in each local government would have access to good health care delivery in their various domain in order to combat maternal mortality in patients State of Osun. While Speaking, the Chief Medical Director of OAU teaching Hospital Ile-Ife, Professor Victor Adetiloye who was represented by the Chairman Medical Advisory Committee of the hospital Professor Jerome Elusiyan appreciated the kind gesture of the wife of the Governor towards the sponsorship of the patients' bill adding that Dodanim Abioye's case is first of is kind to be treated in West Africa Hospital particularly Obafemi Awolowo Teaching Hospital and he thanked God for the success of the surgery. While thanking the wife of the Governor and the president IleriOluwa development initiative the mother of the patient, Mrs Mary Abioye who cannot hide her feelings expressed gratitude to God for the success of the surgery and also thanked Mrs Kafayat Oyetola for the mercy she bestowed on her and her family adding that God has already used the new government in Osun to favour her family. Highlights of the visit was presentation of gift item to the wife of the Governor by the management board of OAU teaching Hospital and her entourage which involve wives of top politicians in Osun and a visit to ongoing Cardialogy building Complex in Obafemi Awolowo Teaching Hospital Ile- Ife.